Background Renal interstitial fibrosis results from activation and proliferation of fibroblasts to myofibroblasts, secretion and accumulation of extracellular matrix, and displacement of normal renal tubules. In contrast to chronic renal disease, acute injury may be repaired, a process that includes a decrease in the number of myofibroblasts in the interstitium and degradation of the accumulated extracellular matrix, leaving little evidence of prior injury. Methods To investigate whether activated fibroblasts demonstrate changes in gene expression that correspond with regression after acute injury but are not observed in chronic models of fibrosis, we used microarrays to analyze gene expression patterns among fibroblast populations at different stages of injury or repair. 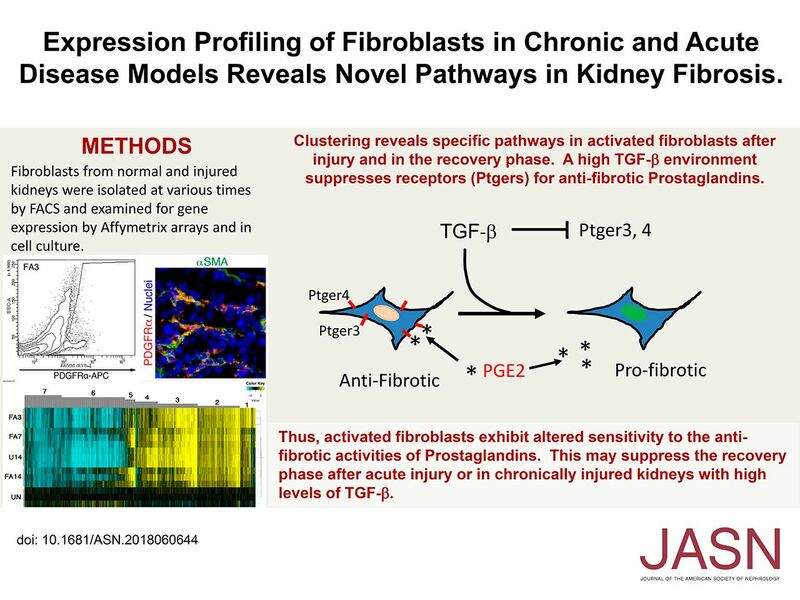 We then mined the data for signaling pathways in fibroblasts corresponding to the acute proliferative, regression, and chronic phases of renal injury. Results We identified multiple gene clusters with changes that correlate with the three phases of renal injury, including changes in levels of receptors for the antifibrotic factor PGE2. In adult renal fibroblast cultures, PGE2 was able to upregulate many genes that are suppressed by the profibrotic cytokine TGF-β, whereas many PGE2-downregulated genes were activated by TGF-β. High levels of TGF-β suppressed expression of a subset of PG receptors in fibroblast cultures, making these cells resistant to any effects of PGE2. Conclusions Inherent gene expression changes in activated fibroblasts accompany the transition from AKI to repair and regeneration. In chronic models, however, activated fibroblasts are resistant to the antifibrotic effects of PGE2 due to suppression of a subset of PGE receptors.